Flagging for waterfowl has been around for a long time – creating the appearance of activity amongst the motionless decoys can, on occasion, lure otherwise uninterested birds. Sometimes the flags are just hats or even boots – kicking a leg in the air to catch the attention of passing ducks, usually divers. I have always felt that the principle is the same one that brings in the birds when you are out amongst the rig – picking up a downed bird or the rig itself. Waterfowling seems to be an endeavor fraught with irony – and so, while Rule Number One will always be “Don’t move!”, it is undeniable that the right movement at the right time can be a good thing. Of course, modern times have brought a “wealth” of technological devices to provide some motion. But – as an avowed Old Schooler – I will leave that subject for others. Most flags I have seen are just plain black. It seems that the usual practice is to find a piece of dark fabric in the rag bin, cut it to size, and tack or staple it to a stick of some sort. We have had a flag in our Great South Bay Ice Scooter for as long as I remember. I cannot recall the details of the early ones – but, given that my Dad would have made it, I am certain that it was not crude. And, I do remember helping him make a new one sometime during my teenage years (the 1960s). My contribution was to suggest nylon rather than cotton. Much of our hunting – certainly that done from the Scooter – was done in sub-freezing temperatures. I clearly recall the black flag wrapped around its staff – and frozen solid. It seemed like we needed something that would not absorb quite so much water. Even salt water would freeze hard when the mercury was down in the teens or low twenties. The other major innovation at that time was the black-and-white pattern. Broadbill was our principal objective when gunning from the Scooter – and the Broadbill is a black-and-white bird if ever there was one. The curvy lines in the original flag were intended to mimic the wing shape of the Greater Scaup himself. A raft of Broadbill , whether actively feeding or just loafing, will always show a few birds rearing up and flapping their wings – to keep every feather dry, well-ordered and in its place. (This habit provides the opportunity to tell the Greaters from the Lessers on the water.) Actually, I can think of two better reasons for the black-and-white. The light and sea conditions are always changing on open water. Sometimes black is more visible, sometimes white is more visible. The birds may see a flash of white on days when a flash of black goes unnoticed. And visibility is important, also, to the crew in the tender or “mother ship”. The gunners use established signals to tell the tender whether they have a bird down or if they are ready to switch with other gunners. An easily visible flag is a reliable, low-tech way to communicate between the vessels. On a side note – it was at this same time that my Dad also sewed up a few smaller flags to be worn on the backs of 6 or 7 of our Model 72 Herter’s Broadbill decoys. I keep hoping I will stumble upon them when going through my Dad’s stuff. As I remember them, they were nylon, black-and-white sewn on the diagonal, maybe 4 inches by 6 inches. Each was fastened to a piece of stiff brass wire and then planted into the styrofoam (Durlon, actually) backs of a few of the decoys. 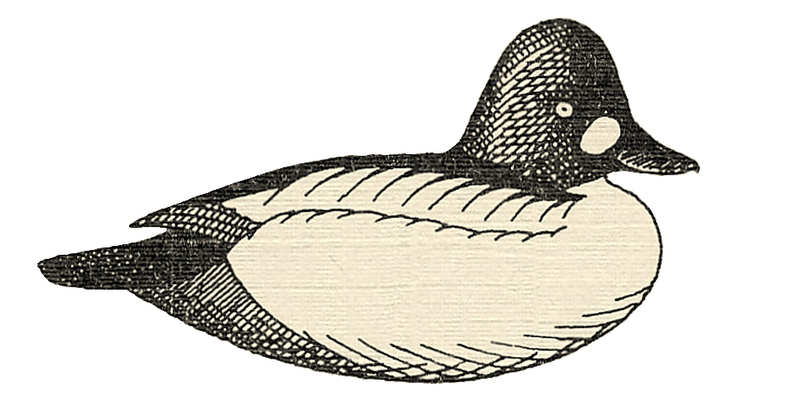 The idea was the same as the flag – and as the “spinning wing” decoys of today. The miniature flags were to flap in the wind and give the appearance of exercised wings. We used them for a couple of seasons – they were a bit impractical in actual use – and I do not know what happened to them. Back to the flag-at-hand. The staff itself on the flag for our Scooter is perfect. It tapers from handle to tip and feels just right. It is 28 inches long. While we use longer staffs on the flags we use for Geese and Brant, the flat-on-your-back position in a Scooter calls for a handier device. And, a little goes a long way in the middle of Great South Bay. I recall the “provenance” of our Scooter’s flag staff. One Christmas, my brother Ted and I had gotten – via Santa Claus himself – a miniature billiards table. The cues were exactly 28 inches long, nicely tapered, with a rubber tip on the distal end. I can only presume we had outgrown the game – the “table” was about as long as the cue sticks – by the time my Dad decided to re-purpose one of the cue sticks as a flag staff. I “took over” our Scooter around 1981. My Dad was living up on Seneca Lake (in the Finger Lakes) and I was back on Long Island as the DEC Waterfowl Biologist. The Scooter was returned to its native waters. The flag was one of the many pieces of gear that needed some attention. It had been fastened to the staff with copper tacks – but they kept pulling out. I sewed a pocket into the staff end of the flag to do most of the work of holding it in place. A single tack kept it from sliding up or down. 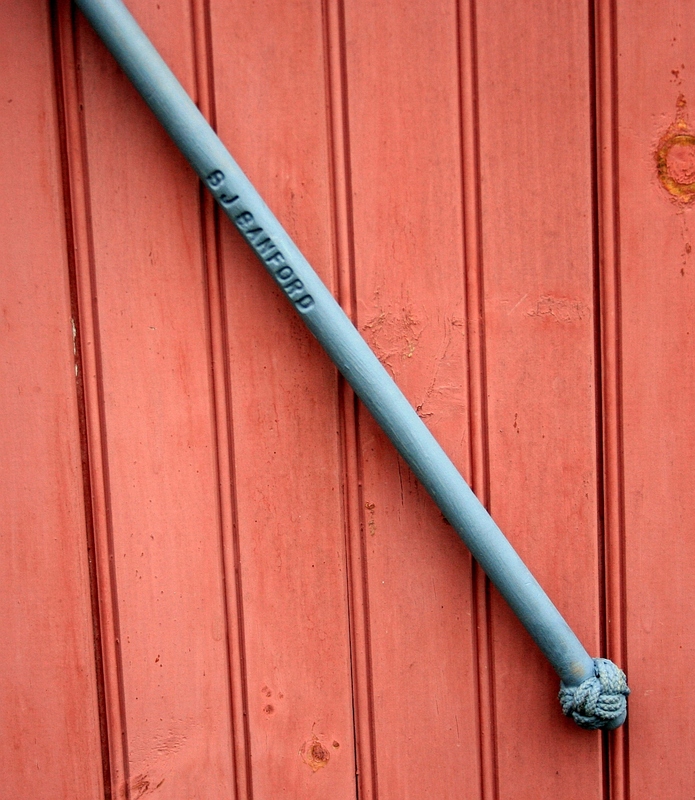 I also put a Turk’s Head (knot) on the handle as a stop – something I tend to do on any of my gear that looks anything like a pole: pushpoles, pick-up sticks, wading staffs, tiller extensions. I even put them half-way down my paddle shafts to act as “drip guards”. I put a new flag on the Scooter staff at the same time I made a new one – from “scratch” – for Craig Kessler’s Two-man Scooter White-Wing (the full build is elsewhere on this site). For the latter boat, it is one of the last finishing touches (I still need to complete the cockpit cover next time I am on Long Island.) Unfortunately, I could not scrounge up another tapered dowel – so White-Wing’s flag has a plain, straight-sided staff. – albeit with a turned knob on the top end. As I mentioned above, something as simple as a flag can be made quickly and still do its job. My approach, though, reflects the way I observed from my Dad. One guiding principle – never stated, only demonstrated – is to make everything as well as you can – and making is better than buying, because, as he would say about many, many things: “That’s the fun of it.” When designing or problem-solving or deciding, my Dad would often use this simple preamble: “Now, a good man would (fill in the blank with just about anything – from making gunning gear to hitting a baseball to building a house to diagnosing a computer……)” Another unspoken principle is widely known – either as “The Devil is in the details.” or “God is in the details.” It is attention to detail that makes something right. By taking some extra time, we always strove to “Do it once and do it right.” Gear should be a pleasure to use and it should hold up over time. 1 – Here is the existing flag from our Great South Bay Scooter. Still serviceable but might as well put new fabric on since I have the sewing machine up and running. 2 – I use a light nylon and Seamstick to keep it in place while sewing. 3 – The middle seams are not lapped-felled – just two seams, one close to the raw edge. 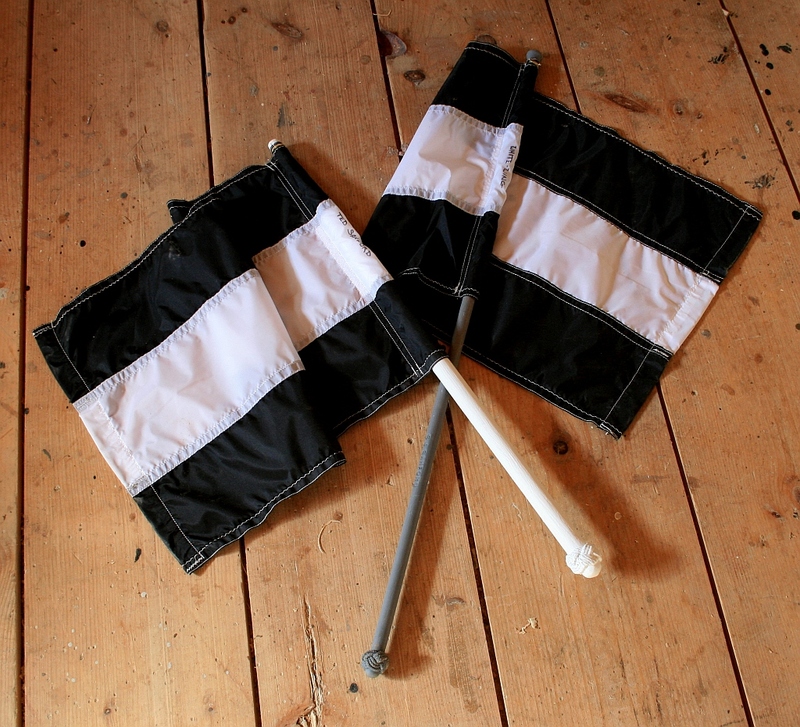 4 – I sewed one long black & white banner to be cut into the 2 separate flags later. 5 – All outside edges are hemmed and the raw edge is zig-zag stitched. 6 – I sew small lengths of # 12 wire into the free end of the flags – to give it some ballast and control, esp. in light airs. 7 – The weights are sewn into closed pockets. 8 – A larger pocket attaches the flag to the staff – and gives MUCH longer wear than just tacks or staples. 9 – The staff fits easily inside the pocket – no need to make it tight but I use 2 seams for strength. 10 – Small holes bored through the top end of the staff will be used to keep the flag from sliding. 11 – I brand any small gear that could go adrift – so it might get returned if lost. 12 – The top of the flag is sewn through the staff. 13 – The Scooter has had a Turks Head for decades – but White-Wing’s flag needs one. 14 – I keep the drawing from “The Marlinspike Sailor” right in my ditty bag. I use decoy line for the knot. 15 – White-Wing’s flagstaff was painted before attaching the flag. 16 – But the Turks Head goes on – and is epoxied in place – after the flag is attached – because this staff already has a button on its top end, too. 17 – White-Wing’s flag sees daylight for the first time. Looks good!! For years since ’72 all I’ve used is a 6-8′ pole with a black flag, worked great!! Even good enough to DRAW THE COAST GUARD AND LAW ENFORCEMENT FROM SHORE!! !